Chicken noodle casserole for the dinner win! 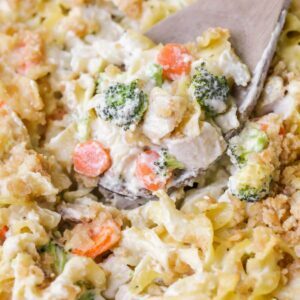 It’s filled with chicken, noodles, broccoli, carrots and more and topped with a butter-y cracker crust making it flavorful and a family favorite. Why are casseroles the best? Something about just throwing everything together in one big dish and cooking it in the oven makes me so happy. 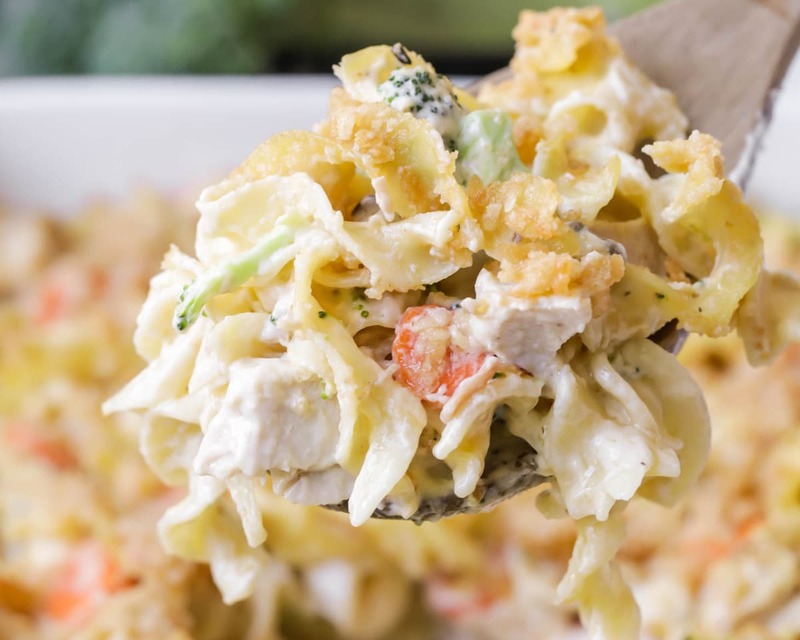 This chicken and noodle casserole is so fabulous. It has chicken. It has veggies. It has pasta. And it’s all mixed together with the creamiest yummiest sauce. Don’t forget the crushed cracker topping!! YUM. I love to make this for when we have company over for dinner. It also makes a great dish to bring to a family in need of dinner one night. This casserole is the best comfort food. And it feeds a ton! It pretty much checks every box. Did I mention it also makes amazing leftovers? This recipe wins at life. You’ve got to try it and let me know how you love it! Make sure you start with cooked chicken. It’s really easy to bake it in the oven and chop it into pieces, but you could also use shredded chicken or rotisserie chicken. I love buying those at the grocery store or Costco and using the chicken in recipes during the week. Life hack! But cooking your own chicken beforehand works just as great. Cook your egg noodles as directed on the package and drain them. 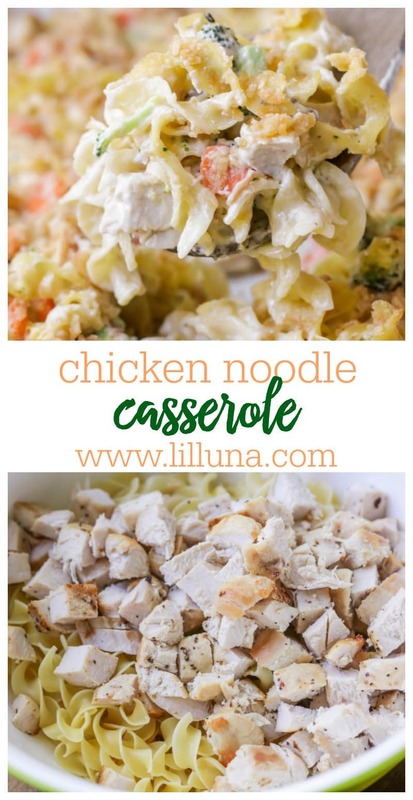 Mix your chicken in a bowl with the cooked pasta noodles. 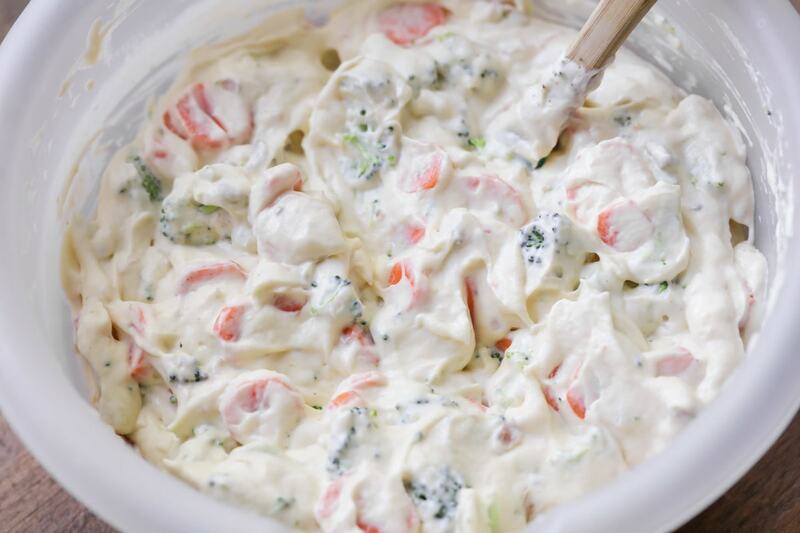 Combine the soups, sour cream, carrots, and broccoli in a separate bowl. Add salt and pepper to taste. Gently combine the two mixtures of chicken and pasta with the soup and veggies. Pour it all into a 2 quart baking dish and set aside. Mix together the crushed crackers and melted butter. Don’t mind me…just drooling over here. I’m a sucker for a crumble topping on anything. Spread the crackers onto the top of the casserole before putting into the oven. Bake for 30 minutes in a 350 degree oven. When it’s slightly brown on top, it’s ready to be devoured! 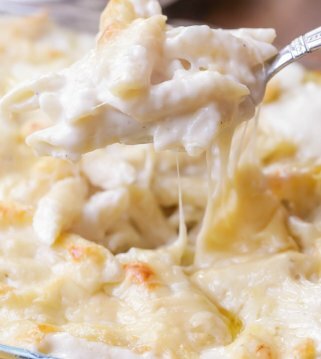 Have I convinced you to try this casserole recipe yet? Let’s review. It’s easy and simple to make. It’s full of flavor and totally delicious. It has chicken, pasta, and veggies. It feeds a lot of people and makes great leftovers. 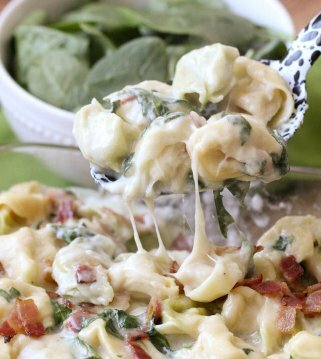 I don’t mean to be bossy but go make this tonight! Chicken noodle casserole for the dinner win! 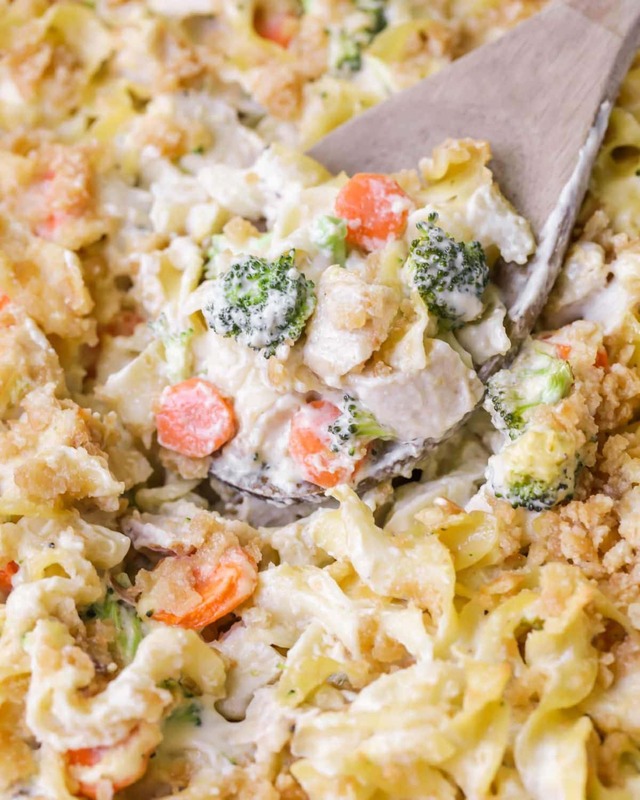 It's filled with chicken, noodles, broccoli, carrots and more and topped with a butter-y cracker crust making it flavorful and a family favorite. Bake chicken at 400 for 30 minutes (or until no longer pink). Cook noodles as directed on package; drain. Cut chicken into small pieces, and mix with noodles. Mix crumbled crackers into your melted butter. Spread evenly over casserole. Bake for 30 minutes at 350 degrees F (175 degrees C). Casserole should be heated throughout and slightly browned on top. ANY CHANGES MADE: baked chicken in oven, added carrots and broccoli. 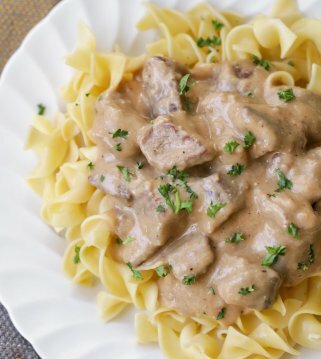 This recipe looks so good and perfect for fall! I can’t wait to try it soon! It is the best! Hope you like it! I make a recipe something like this but used crushed potato chips rath then crackers. Recipe was with tuna not chicken. That sounds good too! I love that there are many ways to change it up 🙂 I will have to try that! Thank you! I was so lost for words on how good this chicken noodle casserole is. It is definitely a must-try for everyone. My guests were raving about it the whole night. Thank you for sharing this wonderful recipe. That makes me so happy to hear 🙂 Thank you so much for giving it a try! I am glad it was a hit! So yummy! My family loved it! Will be making this again! Yay!! Love when families want the recipe again! Thank you for letting me know! To freeze for easy meals (no cutting bonus!) cant wait to try this. Those are the perfect recipes! Hope you like this! 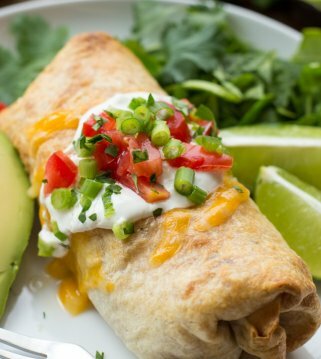 My go-to recipe! My husband and 4 year Old loves it! So So good.